In 1993, Ford established Warriors in Pink as a way to intensify its efforts in the fight against breast cancer. Through actions that support, inspire, and empower patients, survivors, and co-survivors, Warriors in Pink has donated over $136 million dollars in 25 years. 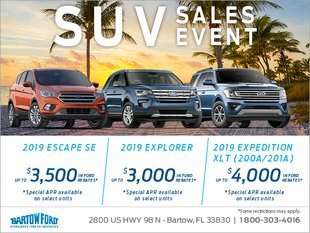 Bartow Ford, your Lakeland area Ford dealership, wants you to know how you can help to make a difference in this fight. There’s more than one way to fight breast cancer, which is why Warriors in Pink works with four different breast cancer charities: Susan G. Komen, Dr. Susan Love, The Pink Fund, and Young Survival Coalition (YSC). Ford donates 100% of the net proceeds from Warriors in Pink to these four charities. Ford also commissions studies that evaluate breast health topics, and creates media opportunities to generate awareness and drive action; they are continuously looking for new ways to support the cause. Through Warriors in Pink, Ford has established two programs: More Good Days, which offers tips, tools, and resources to those touched by breast cancer, and our Models of Courage program, which provides support for survivors. The point of More Good Days is simple — to provide more good days. For those currently fighting breast cancer, check out the tips page where you can learn how little things make a big difference, tips to get through chemotherapy, and how yoga can impact breast cancer treatment. The tools page has resources for everyone; you can send an inspirational postcard, or find healing music to listen to. The resources page has everything you might need to help you through your journey, from meditation to how you can team up in support. The Models of Courage have been there, and because they know how awful the breast cancer experience can be they have advice on getting through treatment. Be encouraged by the Models of Courage’s stories, ideas, and battles. Their words of hope and encouragement are inspiring and uplifting. Ford Warriors in Pink encourages you to be a warrior. No matter how you’ve been touched by the disease, you can make a difference. From giving more good days to participating in events to simply showing your spirit, you can make a difference in the fight against breast cancer. Join Bartow Ford, your Lakeland area Ford dealership, in making a difference.